Bikes are a wonderful component to living in Boulder, as a capstone to the great infrastructure in the community I’d like to build something to hang my bike on. Something I love most about bikes is their simple mechanical design and ability to rebuild them. I think this behavior epitomizes upcycling and not just the bad play on words. I want to use unused bike parts to create a bike stand that displays the beauty of a bike like a piece at the Louvre. It also has a great similarity to dead animals on the wall, but without making a trophy of killing something. I love that this piece is functional. At first, I thought it was a nice looking piece of wall art, then after you explained its purpose it became so much better. Cool idea for a project. I really like how it looks like a skull. How are you mounting it so it can support your bike? This is one of my favorites so far! Its like a taxidermied bike, and its kinda meta. Its definitely very artistic and a lot prettier than the bike stands I’ve seen in stores. Great work! I really like the idea. I would love to hang the bike on the wall to save space. It would be great if you can show us a picture of it supporting the bike on the wall. Maybe add rubber on the handlebars to avoid the bike from being scratched. I am a little concerned about the bike tyers rubbing on the wall. I think you could do more to play with the “longhorn” look. I like the idea of using bike parts to make a wall mount for your bike. Pretty cool! It looks like a deer head, that is a cool, different and modern way of decorating, liked you project. Very cool combination of function and art. I like the similarity to the traditional elk antlers and it’s a nice play on that. Hove you tested it on the wall yet to see how sturdy of a mount it is? I’ve seen a few of these before and thought it was a really cool design and idea. Yours is one of the better ones i’ve seen. Can you clean the seat at all to help it pop? I almost did the exact same project haha. Good on you for creating a good place for your bike to rest after having to cope with your 1904 watts! Looks like a longhorn skull! This would be a really cool wall ornament. So cool- I’m totally gonna do this. Interested to hear how your mounting goes, and whether the bracket works or some sort of pipe clamp would be better. 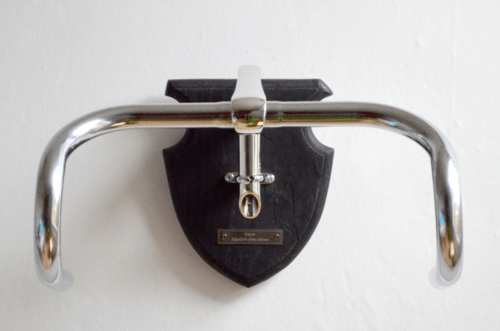 I like the title – classy decor to hang your fixie on. You should totally sell these! You did a great job of making a functional piece of art! I love that it is made of bicycle parts, so it would fit right into any cyclists shop or garage. The hunter animal head aesthetic is a bonus! I understand were you are coming from, my mom would disown me if I went hunting. The irony is strong with this art piece. I think it will draw peoples attention. I like it! I would of liked to see a pattern for the wood instead of a square plate. I really like this idea. As big biker, I am always looking a way to get my bike out of the way, but hooks look ugly. I really like that it is meant to look nice even without a bike. I may add some eye’s on the seat or something to make it look more like a skull, but as soon as you said it, I could see it. This is a great product! Looks awesome and functional. Hipsters would gobble this up. You need to sell these things. I really like the idea and you executed it really well. SWEET. I think its amazing how much the white seat looks like a skull! I imagine that you’ll run into some balancing issues with the bike hanging up, but its still really cool and I hope it works out! Extremely well done! The finished product definitely looks like an animal skeleton.. seems like this could be used for various purposes other than just aesthetic– a coat holder for example. Really cool way to reuse old bike parts! How much weight can it support? Clever title and concept with the use of bike parts and a wall mount. I may opt for a but more color, but that is just me. I love your design! Its really sleek and looks great with and without a bike. How well does it support a bike? I can totally see the steer head. Wouldn’t have thought that this aesthetic could have been achieved with bike components. Great way to have your room decorated with bike components with and without the bike hanging! Really ingenious use of old bike parts, like the deer head look and the functionality of the rack, would like some padding to soften the blow to an expensive frame, want one. The skull aesthetic is a great use for the seat/handlebar combo, and it holds your bike- nice! I almost wish the mounting plate was a little better to make it look like a hunting trophy, in which the backing is usually bigger than the head of the animal. Really good idea to give the mount an independent purpose and appearance when not in use by the bike. Nice name for your project 🙂 Very appropriate. I like the idea and how it looks like a dear but then serves as a hanging rack. I understanding how annoying it is when you have no where to store your bike and this is perfect! That’s awesome that it looks like a deer skull with the antlers still attached. Awesome aesthetic. The white saddle has a great skull look to it. This is a really cool idea and I like how it has a function of holding your bike, being made out of bike parts, and that it has a similar shape to other wall mounts with cow skulls. This turned our really well even though it seems a simple design. I really love it and think it is has a new aesthetic of its own! I love how it looks like the Texas long horn skull mounts they display all the time! It is simple but really impressive and creative use of your old bike parts! I love the deer head! It’s the first thing I thought of when I saw it. Looks simple, but elegant. It will look cool on your wall. This looks classy as hell. Is the finished project fully aesthetic or can you actually hang a still usable bike on this? if you can indeed hang a bike onto this, I feel like you have an untapped etsy goldmine prepped for excavation. I’d sure as hell put one in my room. I’d love to see one where you use some hi-rise handlebars to imitate a big-game trophy. Go big or go home.